So while I didn’t get a chance to mention it because it was during finals–when we basically shut down around here–but I did get to see the brand new Godzilla film directed by Gareth Edwards and starring Aaron Taylor-Johnson, Ken Watanabe and Bryan Cranston. I liked the movie just fine, but I found it way too dreary for my tastes. A Godzilla film should be full of over-the-top craziness and lots of monster fighting/action. This movie…really didn’t have either of that. Instead, they went for a muted, horror vibe similar to the original film. Fine by Edwards & co., but not enough people think of that film when they think Godzilla. I also thought Watanabe was particularly under-served by his material. That said, when the news broke after the film’s opening weekend that Edwards was going to direct the first Star Wars spinoff film due in 2016 (with a script by Gary Whitta), I was still excited. For all my misgivings with it, I couldn’t deny that in Godzilla, Edwards demonstrated an affinity for staging big action scenes and mounting disaster. If a leaked toy list that supposedly lines up to the films is correct, Edwards will be telling the origin of Boba Fett. I say “origin”–more like how the little kid from Attack of the Clones (my favorite of the prequels, incidentally) came to be the stoic bounty hunter we meet in The Empire Strikes Back. His aesthetic seems perfect for that and I think it’ll work out. Josh Trank, of Chronicle and the Fantastic Four reboot, is also directing a spinoff film, presumably the origin of Han Solo. I haven’t seen Chronicle, so I can’t speak to Trank’s skill, but the fact that he directed a nifty little Star Wars fan film several years ago that’s pretty clever in under 2 minutes fills me with confidence. But what really excites is the news that broke last Friday: Rian Johnson, director of the insanely great Looper and the visionary Brick, will be directing Episode VIII and potentially IX. That’s incredibly exciting for a variety of reasons but for me, it boils down to one. Johnson is a director/writer who is incredibly gifted at writing and staging dialogue. Considering that Lawrence Kasdan, writer of Empire and Return of the Jedi, is consulting on the new trilogy, I’m hopeful Johnson may soak up some lessons from him. That’s what I want to see: a Star Wars film that crackles and sparks with as much energy as Johnson’s own films do. And hey, since they’re close friends, maybe a Joseph Gordon-Levitt cameo could be in the offering? Only time will tell. I have this friend who, for a long while, has tried to get me to sit down and watch filmmaker Rian Johnson’s film The Brothers Bloom. 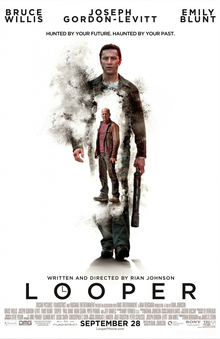 I had been meaning to do so, but now my resolve is hardened after seeing Johnson’s new film Looper, a smart, dark, impactful time travel story that premiered to positive acclaim at this year’s Toronto International Film Festival and is probably one of the best films of the year. The basic setup you’re probably already familiar with from the trailer: time travel, as of the year 2044, the movie’s setting, hasn’t been invented yet, but 30 years from now, it will be. Almost instantly outlawed, it is used by mob bosses to send people they wish to get rid of back to 2044, where assassins known as loopers–a group which Gordon-Levitt’s Joe belongs to–kill them instantly upon their arrival. Joe isn’t your typical hitman. At least, not your typical movie hitman. He’s friendly, non-flashy and is teaching himself French so that, when he gets out, he can go overseas. He lives in a small city in Kansas. He’s a pretty decent guy, although that’s tested when he participates in a series of events involving his friend Seth (Paul Dano) and his older self from the future. Another wrinkle about Johnson’s world: whenever the mob bosses want to close a looper’s contract, they send back his older self from the future with a huge payday attached. After the looper kills their older self, they proceed to live their lives for the next 30 years, until they’re sent back to die, thus closing the loop. To fail in doing this is, as we see in a horrific, absorbing sequence, is a death sentence. But when Joe is sent his older self–played by John McClane himself, Bruce WIllis–to kill, his older self fights back. Knocking him out and stealing his truck, Old Joe attempts to change the present to make a better future for himself. What happens next, involving Joe’s mob boss from the future, Abe (Jeff Daniels) and the events surrounding a single farming mother (Emily Blunt) and her son (Pierce Gagnon), are spellbinding, terrifying and absolutely wonderful. Johnson’s delicate bare-bones screenplay works brilliantly and key to helping it work is his longtime collaborator, Gordon-Levitt. Much has been made of the prosthetic devised by makeup artist Kazuhiro Tsuji to make him physically resemble Willis (and that should almost certainly be worth an Oscar, IMO) but another thing I discovered while watching it is that Gordon-Leviit behaves and acts like a younger Willis. It’s almost chameleon-like, he’s that good. I can only imagine he watched the classic Willis films over and over again. As for Willis himself, he’s good but then he’s always good. That’s nothing new; he makes Old Joe a tragic hero you come to sympathize for and hate in equal measure. Emily Blunt is revelatory here as a tough world-bitten single mother and her American accent is flawless. But the real star? Pierce Gagnon (best known for a recurring role on One Tree Hill), who at only 5 years old is already completely absorbing as an actor. He’s terrifying and incredible. I can’t praise this movie enough. It deserves it. It’s an intelligent, thought-provoking, original science-fiction film in an age with too few of those. Go see it.